I have been trying to get this pattern up for awhile, but I’m never home during the daylight hours. I really wanted to get the picture outside. This is the best alternative I could come up with. I really prefer natural light, but I think the colors are fairly well represented. You can attach any flower. 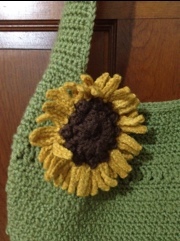 I like this sunflower, but you might want to check out Micah Makes and her interchangeable big button flower. You can find it here,. PC – Popcorn – 4 DC in designated stitch, drop loop. Place hook in first stitch of popcorn grab dropped loop and pull through first stitch. Ch 1 to tighten up popcorn. SC in 2nd Ch from hook, 29 SC, 3 SC in last Ch, 30 SC in unworked loops of stitches on opposite side, 3 SC in end stitch. Join (A) with a slip stitch beside the strap and single crochet the edge of the strap. Repeat on other side. Fasten off. I recommend steam blocking to get the petals to lay flat. Sew to tote. Hi there! I am making this tote for Mother’s day! My mom just loves sunflowers! I am just wondering which side of the bag is supposed to be the “right side”? I can’t really tell from the pictures! I assume the back loop crochets are supposed to form a sort of design (and therefore that is the right side), but also I have a section where you can see staggering where I have moved up with each round. Very cute bag-can’t wait to finish up and give it to my Mom! The back loops should form the edge on the base so it goes from the bottom up to the side pattern. I hope that helps. Your mom is going to love it. 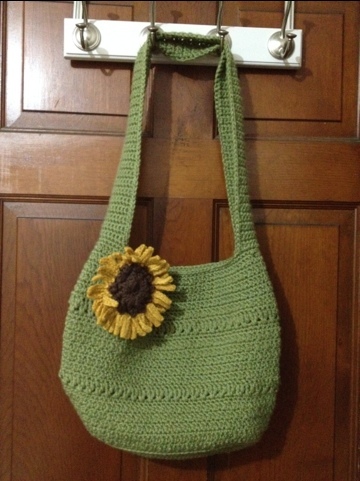 I am just wondering, how much wool is needed for the main bag part (green) for the “Handy Crochet Tote” pattern? Sorry, I just saw this. 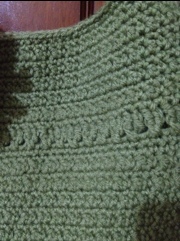 I used 2 3.5oz balls of Dusty Green in Vanna’s Choice by Lion Brand.